Lithograph 10 colors printed with Marinoni press lithographic and hand cut. Over the past 15 years, Belin captured human nature through his own quest, looking for perfection in shapes and lines. He is now looking after another kind of aesthetic pleasure: he started to implement multiple angles and techniques about faces and bodies, to free forms and rules, trying to give a better sense of human expressions and feelings’ diversity. Breaking the rules of proportion is currently his source of inspiration to create abstraction through the representation of multiplied view and angles. It leads him to explore deeper subjective art : his characters faces are disassembled and reassembled to show all nuances and differences of expressions and human feelings. In this artistic process, he keeps using vivid colours and a mix of textures, as you can see for his artwork “Autorretrato”. The lithograph “Autorretrato” highlights his talent to mix photorealism and surrealism to create a special and unique character. Over the past 15 years, Belin captured human nature through his own quest, looking for perfection in shapes and lines. He is now looking after another kind of aesthetic pleasure: he started to implement multiple angles and techniques about faces and bodies, to free forms and rules, trying to give a better sense of human expressions and feelings’ diversity. Breaking the rules of proportion is currently his source of inspiration to create abstraction through the representation of multiplied view and angles. It leads him to explore deeper subjective art : his characters faces are disassembled and reassembled to show all nuances and differences of expressions and human feelings. In this artistic process, he keeps using vivid colours and a mix of textures, as you can see for his artwork “Autorretrato”. The lithograph “Autorretrato” highlights his talent to mix photorealism and surrealism to create a special and unique character. Born in 1979 in Linares, Spain, Miguel Angel Belinchon Bujes, alias Belin, is famous for his talented way of spreading hyperrealism codes among suburban landscapes. This Spanish urban artist has more than 15 years of experience in street art and urban art. Surrealist and innovator, he developed the Post Neo Cubism, a mix of realism and cubism, paying his tribute to Pablo Picasso’s artwork. Breaking the rules of proportion is currently his source of inspiration to create abstraction through the representation of multiplied view and angles. It leads him to explore deeper subjective art : his characters faces are disassembled and reassembled to show all nuances and differences of expressions and human feelings. 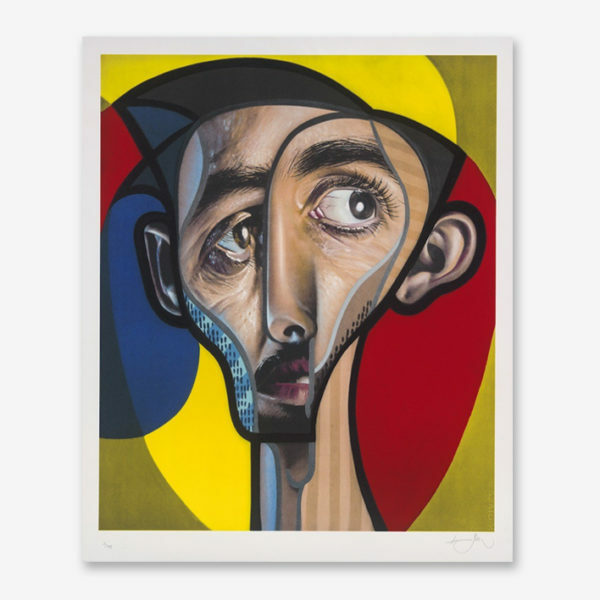 A natural sense for proportions allows Belin to be considered as a reference since he has started his work in 2001. He is well known around the world for his amazing portraits which capture perfectly the essence of the characters. Taking his inspiration from the urban environment, his mural paintings, created only from spray techniques without using stencils, are immediately recognized among others in the eclectic urban art world. These techniques are combined to some elements of its former hyperrealistic draw creating a total new dynamic in his artwork. The distance taken from proportions is making its new style even more unique than before.